EPC Group has over 15+ years of experience in developing disaster recovery (DR) and business continuity management (BCM) strategies for clients around the globe. 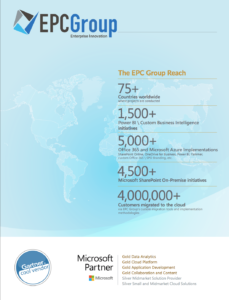 EPC Group develops disaster recovery strategies for organization’s SharePoint 2019 platforms as well as business intelligence environments, hybrid Office 365 implementations, SQL Server and custom applications as well as a wide array of enterprise critical systems. EPC Group takes many different factors into consideration as well as existing DR strategies your organization may already have in place. These factors can differ based on the business vertical your organization is in which can add external factors around legal and regulatory compliance as well as how IT and the business view the criticality of the SharePoint or other enterprise platform and whether or not it is mission critical. In most cases, SharePoint is viewed as one of the most business critical platforms in the organization and the DR and business continuity management (BCM) service level agreements (SLAs) are or should be very strict in regards to response time of an incident. Other elements to consider is the damage to SharePoint’s reputation within the organization as a trusted system for which users can depend on in storing content and records and their view of its future reliability. This is critical because you do not want users going against governance policies and storing content in other locations because they have lost faith in the platform due to lengthy downtime or lost data. There must be clear direction and an accurate inventory regarding SharePoint’s farm level restoration which should also encompass the possibility of a catastrophic loss of the SharePoint Server 2013 environment as well as loss of any hybrid connectivity in case of a cloud-based outage. Your organization must develop clear documentation and processes that include the full scope of the records of all files, databases, and configurations necessary to return content and services to business-critical operation. .
To learn more about EPC Group’s Infrastructure Consulting Services and Solutions, visit EPC Group’s Infrastructure Services offerings page. Preparation for SharePoint 2019, Business Intelligence solution, SQL Server, etc. EPC Group’s initial preparation describes the key areas and components of a SharePoint Server farm and outlines the critical items the responsible parties within your organization must protect through proper inventory and backup procedures to provide as complete a restoration as possible. Failure to itemize and backup any of these components or configurations may result in an inability to return expected levels of service and data availability. Because a SharePoint 2019 platform consists of servers, services, and content, each component represents a critical aspect of the ability to provide a fully functioning SharePoint farm. Even if your organization has deployed a relatively small SharePoint environment, the following sections and related components are just as vital to those of a large enterprise environments to ensure proper functionality and restoration of the organization SharePoint platform. To learn more about EPC Group’s SharePoint Consulting Services and Solutions, visit EPC Group’s SharePoint Consulting offerings page.